Tuesday Esterita Austin presented her lecture “Classic Rock” at the Village Squares Quilters. She’s an amazing artist and presenter. Early on in Esterita’s career she was an art teacher so she not only understands the language of art – she can present it in a way that is easily understandable for her students. I was completely amazed that with one fabric (half yard or fat quarter) the students could get the “illusion of depth” using the colors of the fabric to focus in on the light and use it effectively. At some point I will again take one of her classes – I’m thinking Portraiture. She’s going to be at the Greenville Arms in July. As the program chair I felt it was more important with a class of 16 (17 with me) to be her assistant for the day so I didn’t actually take the class, I learned a lot though! 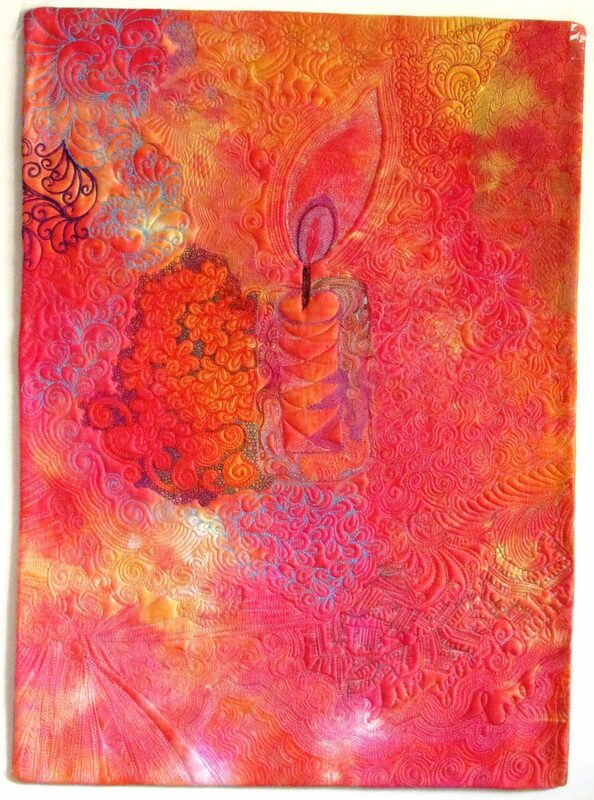 In my rudimentary understanding of art and how we as quilters use it this is well beyond the whole box of crayons analogy, Esterita really delves into light, line, color and offering quilters the opportunity to grow in their understanding of their usage in their quilts. Esterita brings hand dyed cotton & silk organza with her. I will be getting Misty Fuse and fusing the silk organza I purchased to the Kaufman Radiance Gold I have for “Staten Island Sunset”. Oh my goodness is this organza beautiful & it will add so much to the sunset look of the gold color of the Radiance. The hard part will be choosing just the right section of the organza. Knowing me I’ll let serendipity choose how that happens. I have several classes coming up very soon check out my Teaching Schedule page. And remember, I’ll be in Knoxville with AQS in July and would love to see you there! Have a very quilterly day! Will be watching this space for pictures!